I’m at McDonalds for the first time wearing my new, slimmer, 105 pounds lighter body. There are two orders of Chicken McNuggets on the table in front of me, but I’m not here to eat. I’m just sipping a lousy cup of coffee. The food is for my kids. Ari and I picked Annie up at Kung Fu a few minutes ago (she earned her blue belt the other night), and they begged for their occasional allotment of crappy junk food. We don’t make a big deal of it, but we don’t take them here often. No need to get them hooked, let alone feed my addiction. I’ve been clean for nine months. I hate seeing my kids eat this highly processed, nutritionally dubious crap. It’s not food. It’s dreck, loaded with fat and useless calories, and a chemically-created, synthetic taste designed to create psychological cravings that empty wallets and grow sales. My children love it. I guess in moderation it can’t hurt. I was never able to eat McDonalds moderately. A light snack was two Big Macs, a dozen McNuggets with mustard sauce, a supersize fries and a giant, orange-flavored sugary drink. Even more at mealtimes. Supersize Mike. I honestly can’t believe I’m here. I swore McDonald’s off months before my gastric bypass. The old cravings kicked in as soon as the door opened, with the first whiff of rancid cooking oil. You can almost see the sheen of grease hanging in the air. It instantly coats your body, your clothes, your hair. I can see the sheen floating in my coffee, which has an oddly fatty taste. The food smells terrible. It’s gross. It’s delicious. There’s lots of families here enjoying their ‘food.’ I’m not going to say they are all fat, but some are. Kids are smiling, Happy Meal toys held tight in their ketchupy fingers. Parents look relaxed. They’re getting a break from the fighting and whining, while the kids eat their McFat. They don’t know that they are all being seduced by the devil. 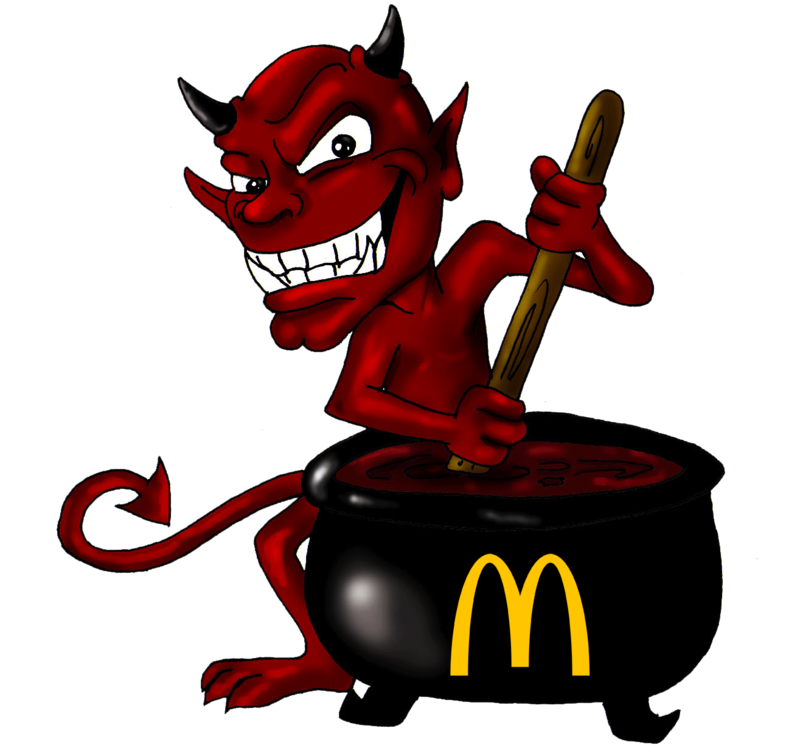 The McDevil. I’m not relaxed. I want outta here. Hurry up Ari, Anna – eat those McNuggets so we can leave. I’m gonna be sick. Hey Mike! LOL…you are so right! McDevil…lmao!! Luckily, I don’t have kids but my two nephews love McDonald’s! They have autism and will only eat here or Wendy’s, neither a great choice for me but I get by on tea or…lol…lousy, greasy coffee! Every great once in a while, I will eat a burger wrap and pull off the majority of the wrap. I swear they put drugs in that greasy crap to draw people in to it! It is amazing how the kids just shove the stuff in and don’t seem to really taste it…to think, they won’t eat pork or beef…just those crappy nuggets! Keep us posted…lol! !